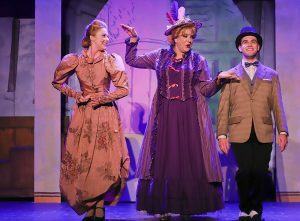 “Hello Dolly” has a long history of community productions following its 1964 opening on Broadway (winning 10 Tony Awards, including Best Musical). This show is always a challenge for any group if only because the history resets the bar for every new attempt. Despite a basic set and somewhat limited fidelity music background, the show succeeds. Once the ensemble moves onto the small stage, we see what a talented cast, colorful costumes and amazing choreography can do for this new interpretation. Dolly Levi (played by Dani Innocenti Beem) tells us she can do anything for anyone who wants to take the chance with life. To prove life just needs a little kick start, Innocenti Beem challenges a love-sick Ambrose Kemper (played by Alex Corey) and love-interest Ermengarde (played by Madison Lewis) to come with her to New York to charm uncle Horace Vandergelder (played by Tim Setzer) into letting them marry. Dolly’s spell is then cast on Vandergelder’s employees, Cornelius Hackl (played by Michel Scott Wells) and Barnaby Tucker (played by Lorenzo Alviso), and they take off on an illicit holiday in New York to find love, vowing not to return before they have their first kisses. Wells is the perfect mastermind of the duo, with Alviso the enthusiastic follower. Enter Molloy’s Hatshop in New York to find Irene Molloy (played by Danielle DeBow) and Minnie Fay (played by ScharyPearl Fugitt) patiently waiting for romance in their little world of hats. Cornelius and Barnaby enter their life with a storm of endearing missteps. Before long, dates for the great 14th Street Association Parade and dinner at the Harmonia Gardens Restaurant are finalized and romance is in the air. The great 14th Street Association Parade engulfs the whole audience as the ensemble lines the side walls of the theatre with music, dance and the special flair of this production. Dolly herself makes a break with her past here as she sings “Before the Parade Passes by, I’m gonna get in step while there’s still time left.” We are off to the upscale Harmonia Gardens Restaurant and act 2. The costumes and choreography of Harmonia Gardens’ staff are brilliant (making up for the set). The waiters’ crisp red and black costumes, with red spats, are superimposed on the choreography of sharp timing and precise movements. The small stage comes alive with military strutting and interfolding reminiscent of the 1920’s. Innocenti Beem appears as Dolly, radiant in a luscious red gown, down the required stairs to complete the picture of luxury in this old New York. We are impressed and ready for anything. Before we know it, we are back in Yonkers with Horace first firing everyone, then admitting he really loves Dolly and rehires everyone with new positions. The “Finale Ultimo” ended the show with all ensemble and cast all onstage to celebrate life and love and song and theatre in general. A great show to warm the hearts of the most stoic audience. This show illustrates that the people onstage make the show, for good or bad. The entire cast shows off their talent in everything they do, making up for the limitations of the stage and sound. In the spirit of the production, this audience was on its feet to applaud the whole production at the end. 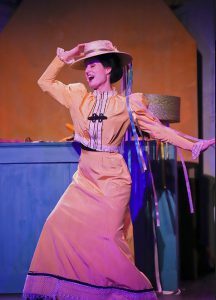 “Hello Dolly,” by Michael Stewart and Jerry Herman produced by Sonoma Arts Live Theatre. Director: Michael Ross. Music Director: Tina Lloyd Meals. Choreographer: Liz Andrews. Scenic Designer: Theo Bridant. Costume Designer: Janis Snyder. Lighting Designer: Courtney Johnson. Sound Designer: Jess Johnson. Properties: Allison Sutherland. Stage Manager: Lindsay John. Cast: Lorenzo Alviso: Barnaby Tucker. Dani Innocenti Beem: Dolly Levi. George Bereschik: Rudolph/Judge. Alex Corey: Ambrose Kemper. Danielle DeBow: Irene Molloy. Zach Frangos: Ensemble. ScharyPearl Fugitt: Minnie Fay. Madison Griego: Ensemble. Molly Larsen-Shine: Ensemble. Madison Lewis: Ermengarde. Oscar Montelongo Medina: Ensemble. Sean O’Brien: Ensemble. Kitty Rutherford: Mrs. Rose/Ensemble. Ty Schoeningh: Stanley/Ensemble. Jennifer Schwarz: Ernestina. Tim Setzer: Horace Vandergelder. Chelsea Smith: Ensemble. Emma Sutherland: Ensemble. Michael Scott Wells: Cornelius Hackl.